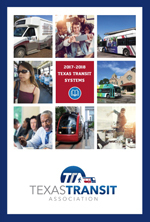 Nominations may be made by any individual employed by a transit agency, an official of a transit agency, a regular or an associate member of Texas Transit Association, any TxDOT employee who works with the public transportation industry, any elected official or employee of local, city, or county governments. An organization may self nominate. You may make a nomination in more than one category. Click below for our online directory. Copyright © 2019 Texas Transit Association. Powered by WordPress. Theme: Spacious by ThemeGrill.